Working on a recent project, I had a task that required me to number the rows of result set; however, I needed to reset the numbering based on the distinct value of a field, or group of fields. 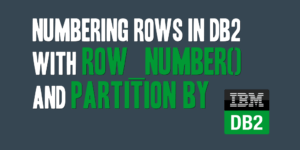 I accomplished my task by leveraging ROW_NUMBER() and PARTITION BY. 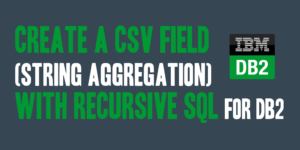 I was recently working on a client project where I had need to create a delimited field from multiple SQL rows returned for a query. 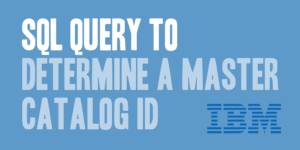 To accomplish this I used a recursive SQL query that allows me to aggregate multiple results together into a single string with a delimiter. I was recently trying to add a unique index on a table, and it gave me an error that the index could not be created because the table contained duplicate records across the fields I was trying to use in my unique index. 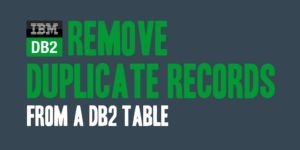 As a result I found a need to remove duplicate records from my table, and decided to share the code I used to do so below. 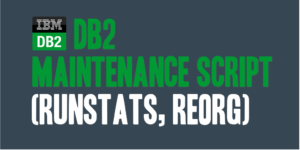 I had a local copy of a WebSphere Commerce database that was performing horribly, and I decided to create a script that would retrieve a list of all available tables for all non-system schemas, and perform a RUNSTATS and REORG for those tables.